In stock 99 pcs. Also available in our walk-in store. 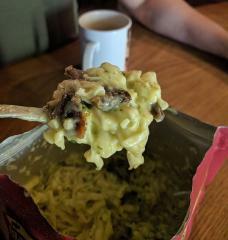 Pig jerky! Oak smoked! Made in Finland! It's what dreams are made of! This is proper greasy and heavy stuff, excellent fuel for outdoor activities. This is some pretty damn tasty pork! 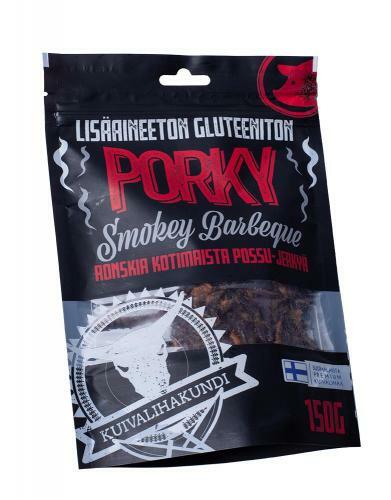 Made entirely in Finland, from Finnish pork and contains no suspicious additives - an honest meat product through and through. If you're looking for the ultimate snack or outdoor food, try this! 230 grams of fresh meat is used to make 150 grams of jerky! Smokey BBQ jerky is dried pork neck. It has an official shelf life of about 6 months, and if we venture a bit out of the Western foodstuff regulations, these are good and edible well after that too. These have just beautiful constitution and taste, not too crumbly nor too stiff. They contain huge protein values and are great supplements for regular grub too. 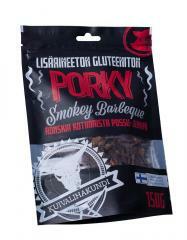 Ingredients: pork, glutein free soy sauce, tomato, onion, sugar, lemon extract, smoke aroma. Ostin hieman nautaa halvemman hinnan vuoksi porsasta kuivattuna. - Tavaran rasvaisuus, näitä kun patikan ohessa mutustaa menemään, jatkuvasti on sormet rasvaisena. Silti suosittelen! On asiallista välipalaa esinerkiksi retkeillessä. Yum yum yum, going to get some more when its back in. What more can i say than that? Interesting alternative to the traditional beef. The way you can fold the cardboard into a tray is a neat idea; however, I eat this sort of thing on the move. I have found there to be a lot of salt in this so it is best to mix it with other foods, unless you are doing a lot of sweating. Jos et tykkää läskistä, en suosittele tätä, jos taas nautit ihran mutustelusta, osta osta! Maussa ei valittamista, itse liha on mukavan mureaa, mutta ne läskipalat vähän puistattaa. Kuitenkin ihan hyvää natusteltavaa patikoinnin lomassa.